Not a true before as this room had parkay flooring. There was also a superficial wall up but it wasn't in the right place for bathroom placement so hubby framed in a new wall. This was before the contractors showed up. 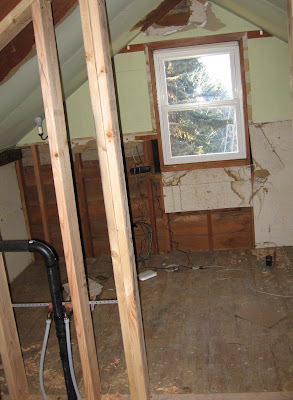 In fact, we had the upstairs plumbing put in when the downstairs bathroom was gutted (black pipe is sink line). By stacking the bathrooms, one on top of the other, the plumbing was more straightforward (a.k.a. more cost efficient). 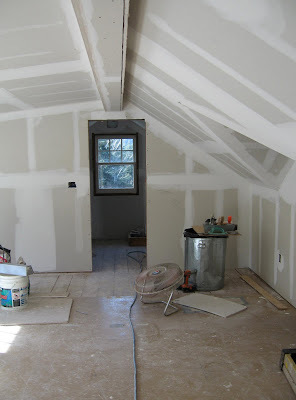 Drywall helps rooms take shape. It's a small master bath, but it feels like a luxury to us as it's our first. Your remodeling project reminds me a lot of when my family restored an old victorian house in Colorado. It was before my dad passed. It had been apartments and we work our rears off to turn it back into a single family home. It was the last project my father did before passing. I miss doing it. We live in Illinois now in another old house but we really havent remodeled much. Oh, I love this bathroom. And that little footstool! 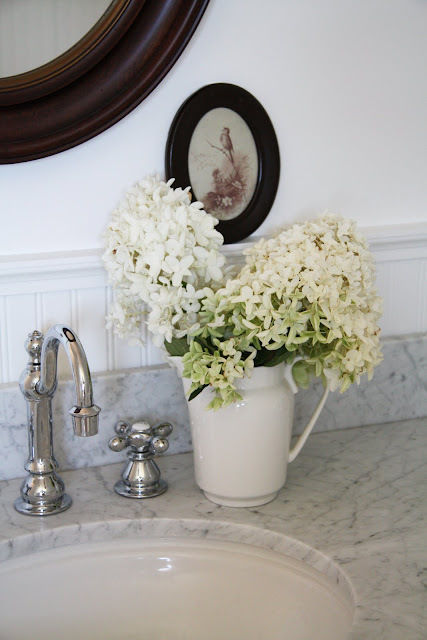 Love, love, love your bathroom style! This is exactly the look I want when we gut our master bathroom. Would you mind sharing what type of hex tile you used? Glazed or unglazed? Is it 3/4"? We are working on a bathroom update & I am having such a time finding the hex tile I want. Thanks! I cannot remember...but we got them at Home Depot. I believe that they're unglazed. They were much cheaper at Home Depot and they looked the same as the ones in the more expensive tile store. Thank you for the quick response! The woman in the showroom kind of steered me away from the unglazed white tile. She was concerned that they would show & trap dirt more than a glazed tile. Maybe unglazed will be fine after all! Love all the beautiful images of your home! Another gorgeous reno. So timeless and beautiful. 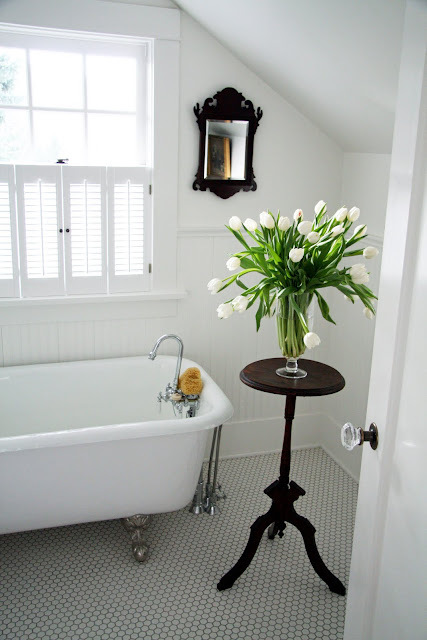 Where is the best place to find the shutters you have on the bath window...that is what I would like to do to ours. I also have a clawfoot tub and wanting to paint it when we pull it out to put tile down. Wow! Your bathroom is lovely :) It turned out really beautiful. Congratulations! I love the fresh and clean look! What brand and color name is the white paint you all use through out the house? I'd also love to know where you got the half-shutters and if you've had any issues with mold with them. Beautiful pictures...I hope my window turns out as beautiful as this one! Can you tell me if you had this tub re-finished/re-glazed? I have a tub I would like to do - but i'm afraid of the chemicals they use. Any advice you can share would be greatly appreciated. This is a new bathtub but it was damaged during the renovation by the contractor so they sent it out to be reglazed. They offered to reglaze right there in the bathroom but I declined as I didn't want to be exposed to the chemicals. It is my understanding that once the glazing cures, it's safe. Wow, so beautiful. 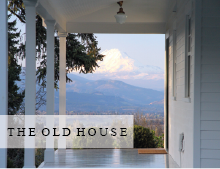 We almost bought an old farmhouse. In fact we still bemoan our decision not to but it -especially after we are realizing how the "non-fixer" home we bought requires. Your home is gorgeous. I know you are busy with twins, but more details about the resources would always be welcome (I love how you included a list at the end of your post on the nursery).